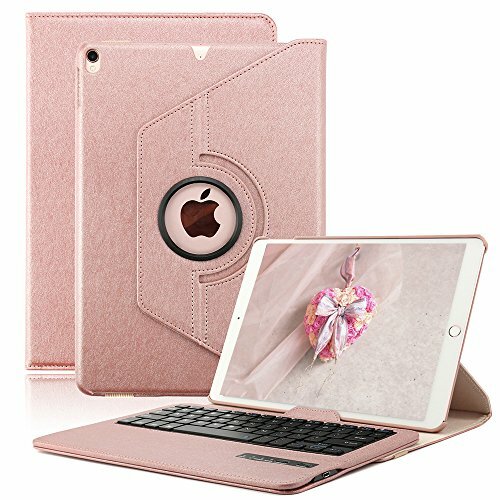 KVAGO Keyboard Case for iPad Pro 10.5, compatible with iPad Pro 10.5 inch ONLY. - Nice looking case, well made and durable, fits very snugly to the New iPad Pro 10.5 inch. - Keyboard is responsive. Bluetoothconnection is easy to set up. iPad Keyboard Case for iPad Pro 10.5 inch. Compatible with Apple iPad Pro 10.5 inch ONLY. (Model Number: A1701 or A1709). Sleek & Stylish Keyboard Case. With the keyboard being detachable it allows you to use the case as a stand and use the keyboard separately. Support different viewing angles: It has a 360 degree rotating stand so you can rotate the iPad to stand portrait or landscape. The whole case is secured with an elastic strap. It provides gret protection for the iPad.As a bonus the keyboard case comes with a screen protector and handy stylus.